Today's information society is built on digital computers that have evolved drastically for half a century and are capable of executing complicated tasks reliably. The human brain, by contrast, operates under very limited power and is capable of executing complex tasks efficiently using an architecture that is vastly different from that of digital computers. In computing, there are various ways to implement the processing of information by a brain. Spiking neural network is a kind of implementation method which closely mimics the brain's architecture and temporal information processing. 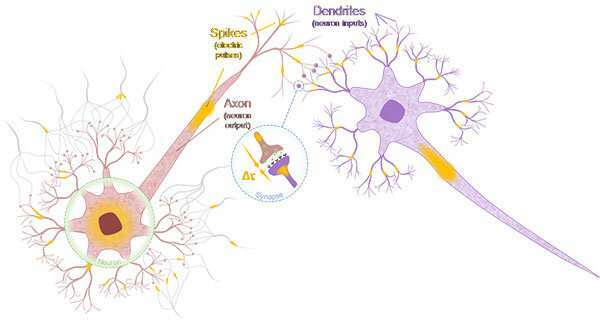 Successful implementation of spiking neural network requires dedicated hardware with artificial neurons and synapses that are designed to exhibit the dynamics of biological neurons and synapses. The research group—which includes Professor Hideo Ohno (currently the university president), Associate Professor Shunsuke Fukami, Dr. Aleksandr Kurenkov and Professor Yoshihiko Horio—created an artificial neuron and synapse by using spintronics technology. Spintronics is an academic field that aims to simultaneously use an electron's electric (charge) and magnetic (spin) properties. The research group had previously developed a functional material system consisting of antiferromagnetic and ferromagnetic materials. This time, they prepared artificial neuronal and synaptic devices microfabricated from the material system, which demonstrated fundamental behavior of biological neuron and synapse—leaky integrate-and-fire and spike-timing-dependent plasticity, respectively—based on the same concept of spintronics. The spiking neural network is known to be advantageous over today's artificial intelligence for the processing and prediction of temporal information. Expansion of the developed technology to unit-circuit, block and system levels is expected to lead to computers that can process time-varying information such as voice and video with a small amount of power or edge devices that have the an ability to adopt users and the environment through usage.